Nail art gems are flashy, colorful decorations for your fingernails. These decorative stones may be clear like diamonds or come in dozens of different colors, ranging from neon to pastel. Gems come in round, teardrop and even square shapes. They look like gemstones used in jewelry, only smaller. Sizes range from 1mm to 2mm. Gems may be rhinestones or made from paste or even glass. Professional nail technicians and nail fashion lovers enjoy making sparkling nail art creations with nail gems. Nail gems come in three main types. You can find all three types of these nail art supplies available at online stores like Amazon.com or at local beauty supply stores like Sally Beauty Supply. Nail gems look nice on real or artificial nails. You can purchase gem tips that already have the design on the nail. This is a major time saver when you want a stylish nail look, fast. These glittering tips attach to painted nails. There may be a hint of glitter or a small row of stones that decorates the seam where the tip and the nail meet. Use sticker gems to decorate your fingernails. Clip the gems you want from the sheet using sharp scissors. You then remove the adhesive backing from the gems and press them onto your nails. These sorts of press on nail gems are ideal of young girls and amateur fingernail artists. Glued on gems are heavier and often shinier than their less expensive counterparts are. These tiny art pieces do not have adhesive backing and are glued in place. 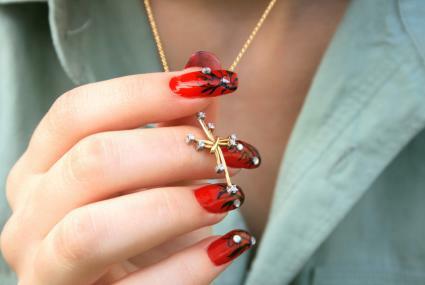 Semi-precious stones and even diamonds may also be nail gems. Expensive glued gems are reusable but should be cleaned and stored properly. Nail gem application is not complicated, but can be time consuming if the design has a lot of detail. Work on your nails in an area that has good lighting. Gather your tools and supplies before beginning your nail art project. This order of application will get you started applying nail gems. Clean and scrub your fingernails. Trim the nails with clippers and a fingernail file. Paint the fingernails with a colorful nail polish. Allow the polish to dry. Arrange the gems on the nail surface, experimenting with the nail arrangement until you get a design you like. Remove the stones and dab the fingernail with gem glue. Place the gems on the fingernail in the arrangement you chose. Cover the nail with a clear nail glue to seal your design. Allow your glue to dry completely before touching the nails. Prying off nail gems hastily or without proper preparation may damage your fingernails and cause you some discomfort. Remove your nail gems the right way to keep your nails looking nice. Soak a cotton ball with nail polish remover. Dab it on the nail gem and allow it to soak. Press the cotton ball down on to the nail for a few seconds. Rub the nail and wipe the gem away. You can make an attractive nail design with your gems without any professional training. Try these suggestions for a pretty look. Single - Place a single gem near the tip of the fingernail. A single stone gives nails a nice flash without too much shine. Paint your nails a single color. Apply the gem while nail polish is wet. After the polish dries, use a white or silver nail polish to paint on a line or starburst around the gem. Flower - A flower design is easy to make. Place a large gem in the center of your fingernail. Surround it with teardrop-shaped stones to make a flower. Gem covered - Cover the nail completely with gems in a variety or in one color. Glue the gems into place and cover them with a top coat of nail glue or a clear polish. Nail art gems are excellent choices for club wear or for a special occasion. Color coordinate your nail gems without your holiday outfits.